Many months ago we gave you some tips on selecting a spirit to pair with your cigar. Now I like a stiff drink as much as the next guy, but there are many times when a bourbon, scotch, cognac, port, or rum (the more traditional cigar cocktail pairings) just aren’t appropriate or desirable. On these occasions, might I suggest you reach for a cup of Joe? Coffee isn’t the most exotic drink – over half of all Americans consume it everyday, and the per capita consumption is 1.6 cups a day – but a fine cigar paired with a good brew can turn the average to the exotic. Coffee and a cigar before noon, in the early afternoon, or after dinner (when a stronger spirit just isn’t possible, like when you need to drive home) can be delightful. And the flavors in a good cup of coffee are highly complimentary to cigars. Vanilla, mocha, chocolate, and roasted notes, as well as nuttiness and earth, can all be found in both cigars and coffee. 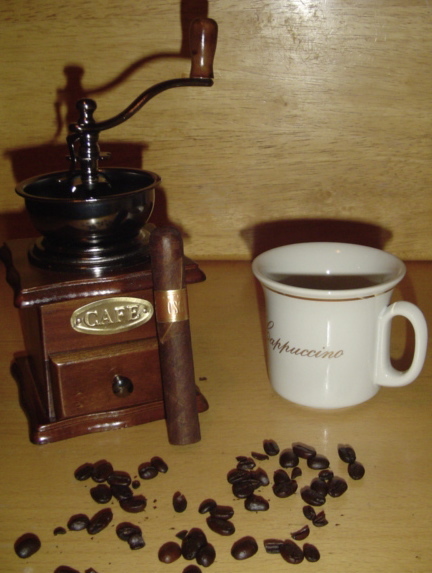 In fact, tasting wheels used for coffee tasting would help any cigar smoker identify flavors in his tasty tobacco treat. But much like bad cigars, too often when people think of coffee they think of bad coffee, like that sludge they serve at your workplace. But doing so would be like thinking that all cigars are like Phillies. I fear that, despite the billions of cups of coffee Americans drink ever year, many people have never had a really good brew. Personally, I make a pot every morning with my French press coffee maker using freshly ground beans from my manual burr grinder. Some people take it a step further, roasting their own beans from their initial green color to the deep brown we identify with coffee, while other have thousand-dollar fully automatic espresso machines. But such a set up isn’t necessary for good coffee. Finally, try different types of coffee from different countries and companies. Not surprisingly, Cuban coffee pairs excellently with cigars, but so can a good cafe au lait, latte, or espresso. Like cigars, you need to try a variety to find your favorite. And when you do, you may find that, from time to time, you’ll pass over the alcoholic beverages in favor of a good cup of Joe. I agree, coffee is a greatly under-estimated coffee accompaniment. I second the references above. Equally important to coffee being freshly ground is that is freshly roasted. Check out some of your local roasters. I recently got a part time job at duncan dounuts and i get free coffee and dounuts there. But until i started work there i didn't drink coffee and now i drink 3-4 cups a day. Give duncan dounuts a try. i believe consumer report rated them #1 suprisingly. anyways thats my 2 cents. have a good one yall. I enjoy a great cup of coffee at the local diner with a good maduro once a week or so. It is a great way to meet new people, and enjoy a morning off. And a quick suggestion, let the waitress know you tip by the hour, and she'll keep the good java flowing. One more thing about the coffee. I, too, use a filtered french press, but I buy my coffee ground. I learned a long time ago that keeping your coffee in the freezer helps keep it tasting good. Try it, I think you will be pleasantly surprised! I'm only an occasional smoker (couple times a month), and so there are times when I fire up a beautiful, medium- to full-bodied cigar, take a puff and taste nothing but an unpleasant spiciness which, I imagine, comes from my unaccustomed palate reacquainting itself with cigar smoke. This can be an unhappy process all-around, since if I don't get to smoke often, I want to really enjoy it when I do. Luckily, I've found that a cup of strong coffee (which I drink daily) helps to mellow out the harsher flavors and let the sweeter, chocolate, cream and coffee flavors shine through. Nowadays, I consider a cup of coffee almost a necessary part of my cigar ritual. Great advice, I am 18 and love the occasional stogie but can't indulge in "stiff drinks". As far as coffee goes, espresso is my favorite; I would like to recommend the Regalo espresso roast from Starbucks. It will run you about twice the usual rate for Starbucks espresso but its well worth it. Hope you enjoy it as much as I do. I delved into the hobby of cigars at the urging of my fiance about months ago. Needless to say, I am hooked, obsessed even. Instead of doing work, I read your blog and reviews, I check prices for the next stick or box we are considering buying. I just love cigars and that's that, regardless of the sometimes funny looks I get when browsing the humidor at my local smoke shop (since I am a lady, I guess). I find there is nothing better (to me) than a good, medium to full bodied cigar and a cup of latin american grown coffee. What a wonderful, perfect even, combo IMO. Coffee is a great enhancment for the flavors in whatever stick i am smoking and I find it helps to balance my palate. Fresh beans and a french press or quality drip coffe maker is essential. Also, think about using purified water that is VERY cold, preferably out of the fridge. It will make a huge difference in the taste of your java, as it gives it a crisp, clean taste. I usually just use the water from the Brita in or fridge. Just Did A Search For Coffee And Cigar Pairings, Came Upon This Article. Love A Great Cup Of Buna An A Nice Stogie. Check Out http://www.cushcoffee.com For Hand Crafted Coffee As Well As Advice On Pairing, We Love Talking Coffee N Cigars. Cheers!